Electrically charged particles from the sun strike moons and planets with great force. The consequences of these impacts can now be explained by scientists from TU Wien. The planets and moons of our solar system are continuously being bombarded by particles hurled away from the sun. On Earth this has hardly any effect, from the fascinating northern lights, because the dense atmosphere and the magnetic field of the Earth protect us from these solar wind particles. But on the Moon or on Mercury things are different: There, the uppermost layer of rock is gradually eroded by the impact of sun particles. New results of the TU Wien now show that previous models of this process are incomplete. The effects of solar wind bombardment are in some cases much more drastic than previously thought. 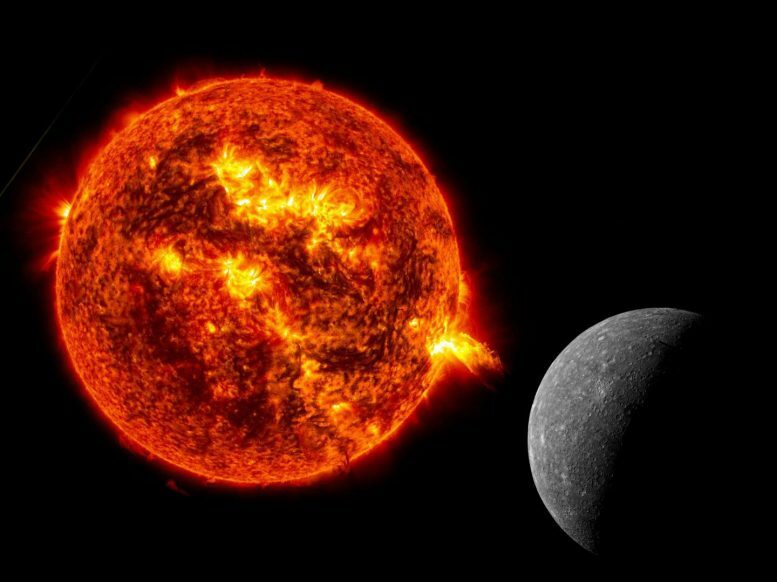 These findings are important for the ESA mission BepiColombo, Europe’s first Mercury mission. The results have now been published in the planetology journal “Icarus”. “The solar wind consists of charged particles – mainly hydrogen and helium ions, but heavier atoms up to iron also play a role,” explains Prof. Friedrich Aumayr from the Institute of Applied Physics at TU Wien. These particles hit the surface rocks at a speed of 400 to 800 km per second and the impact can eject numerous other atoms. These particles can rise high before they fall back to the surface, creating an “exosphere” around the Moon or Mercury – an extremely thin atmosphere of atoms sputtered from the surface rocks by solar wind bombardment"
Protons make up by far the largest part of the solar wind, and so it was previously thought that they had the strongest influence on the rock. But as it turns out, helium actually plays the main role because, unlike protons, it can be charged twice as positively. And the contribution of heavier ions with an even greater electrical charge must not be neglected either. A cooperation of different research groups was necessary for these findings: High-precision measurements were carried out with a specifically developed microbalance at the Institute of Applied Physics. At the Vienna Scientific Cluster VSC-3 complex computer simulations with codes developed for nuclear fusion research were carried out in order to be able to interpret the results correctly. The Analytical Instrumentation Center and the Institute for Chemical Technologies and Analytics of the TU Vienna also made important contributions. Cooperation partners of the research project were also the Physics Institute of the University of Bern and the Space Institute of the Austrian Academy of Sciences in Graz, which will now help contributing the new findings to the analysis of the forthcoming ESA space mission.